Designed to be worn on the index or pinkie finger. 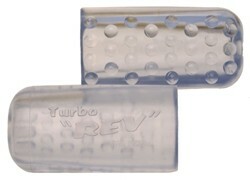 When worn on the index finger, Turbo "Rev" will help create axis rotation for more hooking reaction. When worn on the pinkie finger, Turbo "Rev" will help reduce axis rotation giving you a more even and controlled ball reaction. Can also be worn to protect your fingers from discomfort caused by excessive friction during release. Packaged in re-sealable clam shell for better display and easier fitting. Available in Assorted colors and clear ICE™. Due to the time it takes to produce the Turbo Rev Finger Gripper ball it will ship in immediately. We cannot ship this ball outside the United States.